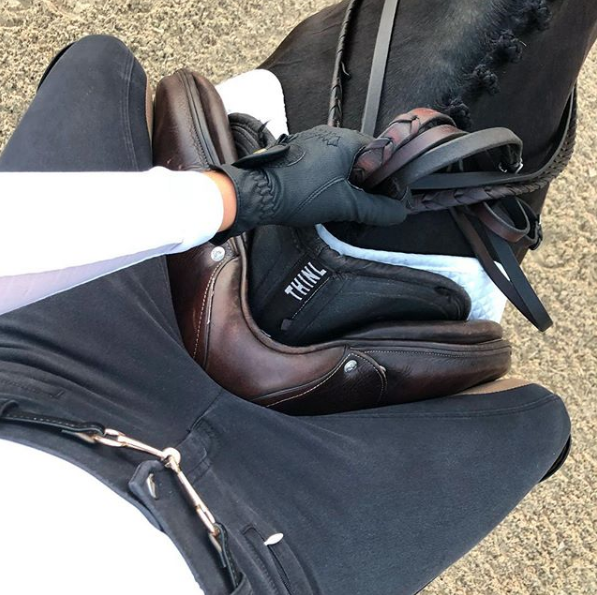 I started taking these saddle shots when I first started My Equestrian Style because there definitely is a beauty to this view; the leather tack, the clean footing and the fun outfit combinations! It totally encompasses my passions of riding, fashion and creative photography all in one snap! 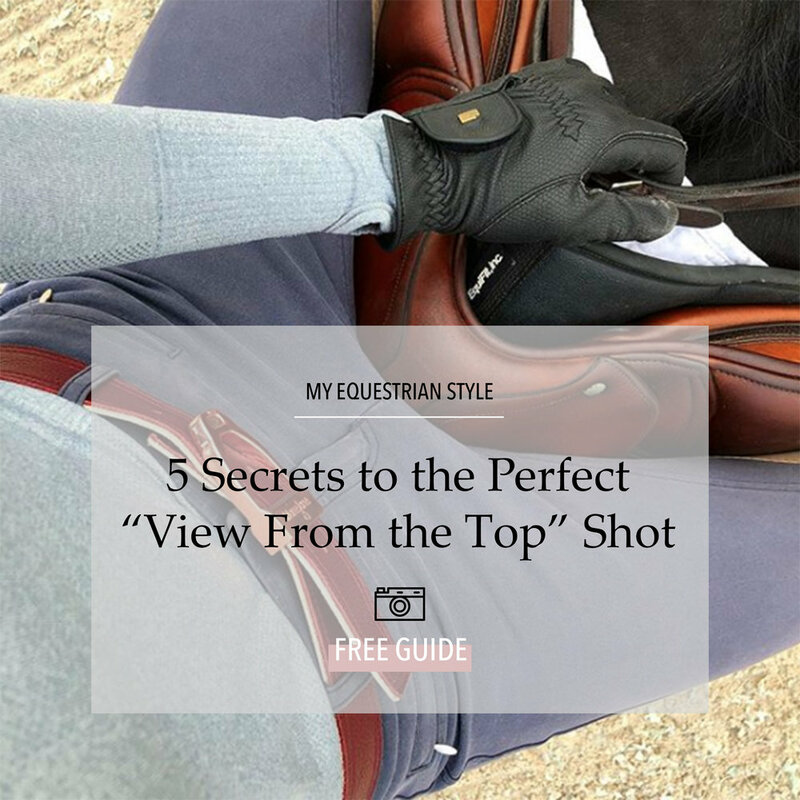 Many equestrian blogger babes have created their own spin on this view, but today I wanted to give you my 5 Secrets to perfect my "View from the Top" Shot (or VFTT!) Keep reading! I'll cut right to the chase: I have 5 simple secrets to get my VFTT shot! 1. EQUIPMENT | The only equipment I use for my VFTT shots are my iPhone. Even though I am a professional photographer, I do love my iPhone camera! Some of the above shots are taken with my old iPhone 8+ and others are my iPhone 10. I can't really tell the difference because a lot of what makes a photo good quality has to do with my second secret! 2. LIGHTING + LOCATION | For me, lighting and location are more important than what I am taking my VFTT photo with. While you can capture this shot any time of the day, I prefer the lighting found in the early morning or just before sunset. These time frames I lovingly refer to as "The Golden Hours." To be specific, the hour after sunrise and the hour before sunset are ideal because you won't have to deal with harsh light and shadows. If you are taking a photo in these time zones, your location doesn't matter. If you are taking your VFTT in the middle of the day, you have to be strategic. I try to get the sun at my back so that all of the bright sunshine is blocked. All three photos below are taken during harsh sun conditions and I have my back to the sun! The rest was editing tweaks which I will get to later! 3. WARDROBE + TACK | A good combination of clothes and tack can make or break this photo! Something I always make sure I have is a clean saddle and saddle pads. Nothing is worse than a dingy saddle pad or scuffed saddle! For my outfits, it always comes down to a pair of clean breeches, a crisp and tucked in top and some chic accessories. I often wear a belt as my main accessory, but sometimes I sport a watch or bracelet for some added bling. When in doubt, less is usually more! 5. EDITING | If you have good lighting and conditions, you will only need to make minute tweaks to your VFTT snap. I usually will slightly brighten, contrast, warm and sharpen a photo to match my feed. I do all of this minor editing on the Instagram app. If more severe editing is necessary I will use Instagram and Facetune 2. Almost always, I will need to adjust a photo that has too many shadows or harsh sunlight in the shot. I can soften this using brightness, highlights and shadows. If a shot is super bright, I will turn down the brightness, down the highlight and up the shadows. If the shot is really shadowy, I will bump up the shadows and bump down the highlights. The only time I use Facetune 2 is on the odd chance that I have a mark on my breeches, saddle, etc. Above all, have fun with it! No VFTT is going to be perfect, but these 5 secret steps are going to help to get to a beautiful View from the Top photo. I'd love to see your VFTT photos, so make sure you tag #VFTT so I can see them and post them on my story! !